This project will provide solutions to multiple problems. The first one is the security of information technology. The range of issues addressed includes zero-day exploits (e.g., WannaCry ransomware), denial of service attacks (e.g., Mirai), hardware attacks (e.g., based on the Meltdown and Spectre CPU flaws) up to novel types of hardware Trojans. The possibilities for these attacks originate from weaknesses in the long IT supply chains and threaten the confidentiality, integrity, and availability of systems. The second problem is that these attacks can also threaten the safety of products, e.g., in energy infrastructures or in the automotive industry. The third problem lies in the loss of value added because of a migration of production and competences towards competing economies (e.g., US and China). Sovereignty would mean to have full control of the characteristics of information technology, to be sure that no hidden features are implemented, that no business secrets can be stolen, and to benefit economically from such control. These objectives are difficult to meet because any component involved in the supply chain may have multiple flaws, possibly even due to problems in the development tools used. Furthermore, while more secure components will reduce overall costs, developing them may initially increase costs. Hence, regulation making secure systems mandatory can help because competing companies would operate under the same conditions. Since other parts of the world are also working on controlling the supply chains, research on options and there implementation in industry is indispensable. The objectives will be pursued by means of expert interviews, dissemination activities, workshops, maintenance of a website, as well as participation in the specification and development of prototypes. 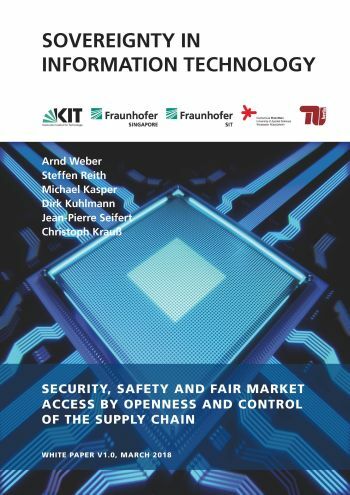 If you would like to provide feedback, if you are interested in co-operation, or if you would like to second the content of the White Paper, please contact arnd.weber∂kit.edu.